Oculus store bundles will now adjust their price if you already own a game(s) that's included in the bundle. Tyler wrote: Oculus store bundles will now adjust their price if you already own a game(s) that's included in the bundle. Wags, did you get your 3rd sensor set up? Wall mounting them so they don't move? I've found that if a sensor even gets bumped it can mess up the guardian system. I haven't set it up yet but I had already installed a USB card when I first got the Rift. I think I'll probably mount them, I just need to decide how I want the room to be permanently set up. wags83 wrote: I haven't set it up yet but I had already installed a USB card when I first got the Rift. I think I'll probably mount them, I just need to decide how I want the room to be permanently set up. You better get it done before tomorrow night! If there's one app that needs a 3rd sensor, it's BigScreen. Tyler wrote: VR Roundtable podcast did a good episode today on all of the Oculus news from last week. They covered some of the software stuff that didn't get talked about as much as the hardware announcements. The menus are going to be changing a lot for us. I like the new pause menu a lot, it's nice being able to see your desktop during a game. You can even pull a window put and see it during the game play. I watched a YouTube tutorial while doing it in game, all without taking the headset off. The 45 seconds it takes to get the headset out of the closet, plug it in, and unwrap the cords is sometimes enough of a turnoff not to mess with VR. I might a slight update today to help with this. I use to keep my 10ft extension cables coiled up and just resting on top of the computer tower. I ran them behind my desk and into the drawer area. 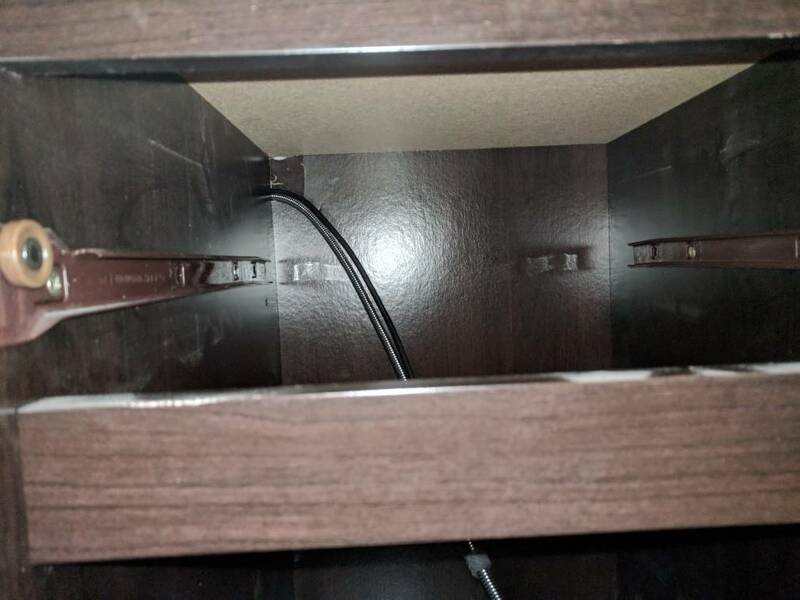 I can now keep the headset in the bottom drawer (needs to be cleaned out some more still). I can keep the headset plugged in. When I want to play I just need to open the drawer and put it right now. No more plugging/unplugging between sessions and my desk area has slightly less clutter thanks to the extension cables no longer being out all the time. I always have mine plugged in too, but I haven't figured out a good storage method so it just sits on an empty portion of the desk. Made these changes and was excited to try out some new games I got from the Steam Sale...and neither game worked. The menu was also above my head in the Oculus screen. This is what I get for allowing unsupervised kids to play it all night on Friday. Reinstalling Oculus hoping that fixes it. Controllers seem to be tracking okay in the home screen, just weird in game and the toolbar thing. Bump. Wilkins has a lot to read. Am I the only one using stick on lens protectors? Tyler wrote: Source of the post Am I the only one using stick on lens protectors? Tyler wrote: Source of the post No more plugging/unplugging between sessions and my desk area has slightly less clutter thanks to the extension cables no longer being out all the time. Man I am super jealous. My new session start time is like 5 minutes. I just can't fathom a way to make it easy for my situation. CrckrJack wrote: Source of the post Man I am super jealous. My new session start time is like 5 minutes. I just can't fathom a way to make it easy for my situation. This has changed since posting. 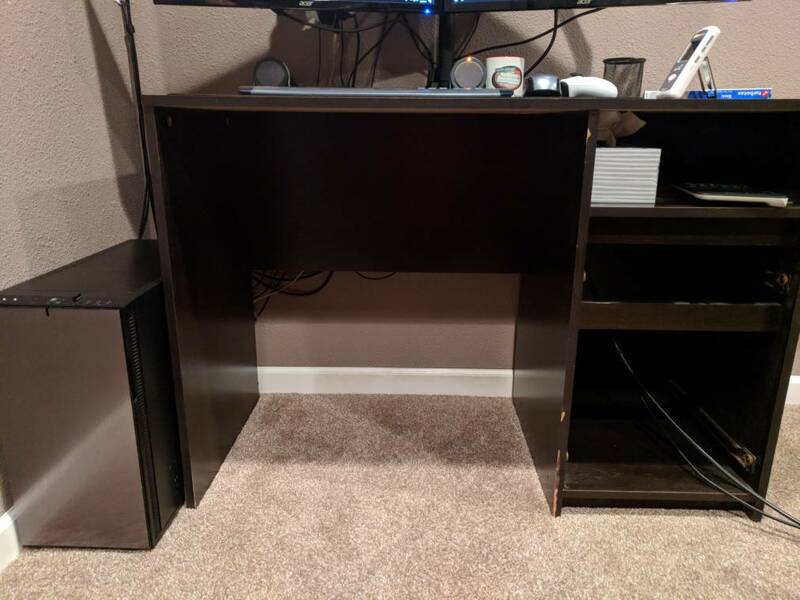 I have my new desk now and I have quick connect HDMI/USB mounted under the desk. Doesn't take more than 15 seconds to get the Rift out and plug it in. It is not incredibly often that we play without having people over.